but this doesn't actually authenticate with the server. I can send messages to users on the server, but I normally require a user/password authentication on the server. As far as I can tell I have to use the "javax.sip.OUTBOUND_PROXY" property, but I can't find any documentation on how to set a username or password. Has anyone else had any success with this? REGISTER request is used to update the current location of a user on the REGISTRAR server. The application sends a REGISTER message informing the server its current location which in turn is stored in location server. When a caller calls a user the proxy server uses this information to find the location of the callee. Register request should be sent by the client periodically. The validity of the REGISTER request is determined by the Expires header. Now lets see how to construct the above request using the NIST SIP Stack. First step is to create a class that implements the SIPListener. Make sure your SIP Stack is Initializing NIST JAIN SIP Stack. Once all the headers are created it is time to create the request itself. Now that the request object is created with all the necessary headers it is time to send the request. inviteTid = sipProvider.getNewClientTransaction(request); // send the request out. Once the request is sent successfully the response will be passed to the application using the processResponse callback in SIPListener. // send the request out. // Send the request statelessly through the SIP provider. // Display the message in the text area. // If an error occurred, display the error. During a SIP request if the server responds with 401 Proxy Authentication Required or 401 Unauthorized then it means the client has to replay the same request again with MD5 challenge. The client should use nonce value from the response header WWW-Authenticate. WWW-Authenticate: Digest realm="sip.linphone.org", nonce="JbAO1QAAAAA3aDI0AADMobiT7toAAAAA", opaque="+GNywA==", algorithm=MD5, qop="auth"
The client should use nonce to generate the MD5 challenge and make the original request again with the Authorization header. If qop in the response header is “auth” then the final MD5 hash is calculated using step 3a else if it is undefined or empty refer step 3b. I believe there's an example of usage in the code base. Not the answer you're looking for? Browse other questions tagged java sip jain-sip or ask your own question. 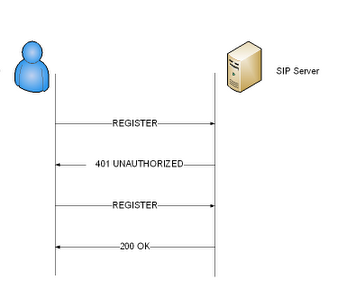 AIN SIP Java API to register to a asterisk server? What authentication header to use in Asterisk? Asterisk/JAIN-SIP why do I need to authenticate several times? SIP signal with public wifi?